OK, before I start, let me make full disclosure: my new Tesla was delivered today. Yes I know it's a car for the 1 percent, and that my modest green initiative of buying an electric vehicle won't exactly save the biosphere. And indeed, I am indebted to Elon Musk, the CEO and chief product architect of Tesla Motors, for creating this piece of engineering and technology magic. However, the process of deciding to purchase this vehicle has caused me to reflect on its founder and his place as a candidate as a truly extraordinary CEO -- perhaps the greatest of the modern era. My criteria are simple: wealth creation, industry reinvention and lasting impact on humanity. Musk is an extraordinary wealth creator. He's the first to build a thriving car company since Chrysler in 1925. With a market cap of $30 billion, Tesla blows the doors off Chrysler. More than that, he has reinvented the automobile itself -- creating new archetypical smart and green personal transportation vehicle with mind-boggling performance. According to Consumer Reports, the Tesla is not just the best electric car they have tested -- but the best car they have ever tested. Unlike many of the other contenders for top CEO, Musk is not just dedicated to wealth. He is building businesses to help solve some of the biggest challenges facing humanity. He sees shareholders as only one stakeholder in the corporate mission. 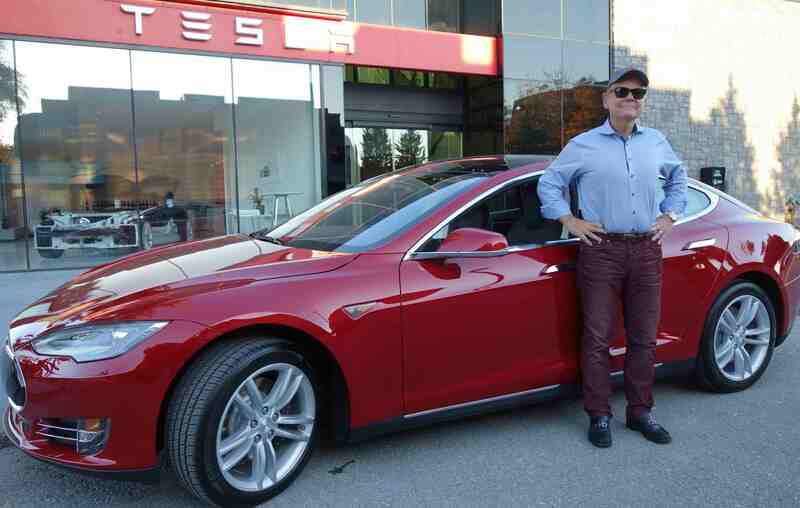 In an interview with The Wall Street Journal, Musk emphasized that "the reason I created Tesla was to accelerate the transition to sustainable transport. And I made that clear to investors." Accordingly, some investors were taken aback when Musk announced this summer that the company would make all of its patents available to any other company, unconditionally and "in good faith." Musk wants to create a vibrant eco-sensitive transportation industry in which his company will compete. His goal is not to just make the vehicles, but also the batteries these cars will need. To help that happen, Musk committed $5 billion to a battery manufacturing plant in Nevada. He hopes to build half-a-million cars by 2020, generating high demand for those batteries. Musk wants other electrical-vehicle companies to adopt his batteries as the power source. It turns out integrity can help create business success. His vision for eco-sensitive transportation is just one reason why Vanity Fair (OK, not exactly the most authoritative source of business acumen but still widely read) just picked him as the world's most important living disrupter, having "staggering ambition with a do-gooder sense of purpose has made him revered among his peers." Vanity Fair points out the total admiration of Musk by Google co-founder Larry Page. "You know, if I were to be hit by a bus today," Page is reported to have said, "I should leave all of it to Elon Musk." But Tesla is only one feather in Musk's cap. He also helped bring pioneering PayPal to life. Again, he spotted a new need: consumers wanted a secure means to pay for goods purchased online. PayPal turbocharged eBay and online commerce by giving buyers confidence their funds were safe when buying a beanie baby or camera lens from the other side of the planet. Musk also oversees the Solar City, which makes 25 percent of the solar panels made in the U.S. This is just another facet of his zeal to tackle the largest crisis facing humanity today: climate change. He also spotted a need for affordable space travel. So in 2001 Musk founded Space Exploration Technologies, better known as SpaceX, to develop and manufacture space launch vehicles. Musk is SpaceX's chief executive and chief technology officer. The company's first vehicles were the Falcon 1 and Falcon 9 rockets and the Dragon spacecraft. On May 2012, SpaceX docked a Dragon with the International Space Station, making it the first commercial company to launch and dock a cargo vehicle to the ISS. An impressive feat for an eleven-year-old company. Earlier this month SpaceX landed a $multi-billion contract to take astronauts back and forth to the ISS. NASA retired its famous space shuttle fleet in 2011, and ever since has had to rely on Russia's good will and its Soyuz vehicles to ferry astronauts to the International Space Station. Musk will eliminate this inappropriate dependence. There are many CEOs who have led spectacular turnarounds or taken epic steps to make their company better. Lou Gerstner stopped IBM's decline, and Ford's Alan Mulally may have saved the company. Tim Cook has taken Apple into the post Jobs era -- a sizable, some say unlikely feat. Nike's Phil Knight, among other things reinvented Nike's labor practices in the developing world, and in doing so set new standards for supply chain integrity and sustainability. There are great women CEOs transforming massive and important companies, notably Pepsi's Indra Nooyi, HP's Meg Whitman and Xerox's An Mulchay -- all of whom have put a sluggish or failing company back on track to success. Not to mention transformational women in the entertainment and information industries like Oprah Winfrey. I'd disqualify all of the Wall Street CEOs. Many have accumulated staggering wealth, but no one has stepped up to transform an industry in urgent need of reinvention the way that Musk is changing the transportation industry. Driven by sheer greed, the financial services industry nearly brought the global economy to its knees in 2008, and nothing has changed since. GE's Jack Welch is often touted as a great CEO but he wouldn't even make my top 50 list. "Neutron Jack" as he was called was best at cost cutting rather than being an innovator or game changer. He was a good manager in the traditional sense but to me he was not a great business leader for our changing times. Jeff Bezos' modest online bookstore became a juggernaut that redefined how online retailers understand their customers. Richard Branson brought the personal touch to hundreds of service-oriented companies such as airlines and mobile phones, but his total impact is still in flux. Warren Buffett was the most successful investor in the past century, and has amassed an astonishing amount of wealth for himself and other shareholders of Berkshire-Hathaway. John Chambers piloted the extraordinary Cisco success story, whose technology shaped the World Wide Web. We are all in his debt. Bill Gates created a great company and then clawed his way through decades of PC turmoil to reign supreme, perhaps to see his accomplishments eclipsed by the mobile revolution. As did Michael Dell. Larry Page, Sergey Brin and subsequently Eric Schmidt made the web usable and then proceeded to pioneer a new species of company: A digital conglomerate. Howard Schultz reinvented the North American coffee break and brought many fair trade practices to a brutally cost-competitive commodity industry, but he hasn't reshaped our societal landscape. Fred Smith is the founder, chairman, president, and CEO of FedEx. He reinvented logistics and reshaped global commerce. Ted Turner Understood the power of delivering content to the voracious 24-hour audience. Mark Zuckerberg quickly created amazing wealth but the jury is still out on Facebook's enduring value and the social cost to all of us from Big Data. Steve Jobs is still the gold standard, having not only saved Apple, transformed the computer, entertainment and communications industries but also changed the lives of hundreds of millions of people. Musk has not had that kind of impact. But his sense of purpose extends beyond a desire to innovate, create wealth and chance consumer experiences. He seems driven help solve some of humanities most vexing problems through entrepreneurship. Time will tell if he ranks with the likes of Henry Ford as the great business leader called forth by changing times. Don Tapscott is the author of 15 widely read books about new media in business and society, including most recently The Digital Economy Anniversary Edition: Rethinking Promise and Peril in the Age of Networked Intelligence, out now. A version of this article was published on LinkedIn.